Make your choice from the list below to get the answers to the most frequently asked questions. If the subject about which you want to get further details is not on the list, please contact us. Can I get the rates without making a reservation? Yes. In order to get your rate without having to make a reservation, please complete the form on the booking engine all way to the 'Rates' page. If you choose to make a reservation once you have checked the rates, you just need to click on the 'Book now' button. How can Europcar protect my personal and financial details online? Our internet booking site is totally secured by an SSL server (Secure Sockets Layer), a system that guarantees the confidentiality of your transaction. How can I know if my booking is confirmed? At the end of the booking process you will access a "Confirm booking" page indicating your booking number. You will also receive email confirmation reminding you of that number as well as the details of your booking. We advise you to print it and keep it, and to present it when picking up the vehicle. Is it possible to modify or cancel a prepaid booking after it has been confirmed? If you have prepaid your booking and your needs have changed, you really must cancel your booking and make a new one. The amount initially charged on your card will be automatically re-credited in case you meet all the deadlines provided for on the general terms of prepayment. Please note that you can only modify or cancel bookings made by you on our website. What does the message 'Your session has timed-out' mean? For security reasons, if you remain inactive on our website for some time, we will interrupt the connection and will make sure that all the personal information you entered is erased. In order to connect again, please click on the link. ACRISS (Association of Car Rental Industry Systems Standards) is an interprofessional standard that helps classify vehicles identically in different categories and no matter who the renter member of this association is. 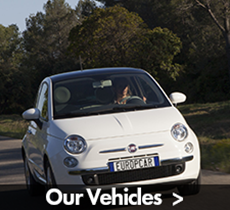 Which vehicles does EUROPCAR offer for hire ? Is there a specific driver's licence needed in order to drive a family car or a commercial vehicle ? All our family cars and commercial vehicles can be driven with a regular driver's licence (up to 3T500 GVWR). However, your driver's licence must be valid and readable (in Latin, Anglophone or Arabic characters). Otherwise, you will be asked to provide an international driver's licence. Another condition is that you have held a valid driver's licence for at least two years and you are over 21 years old. Can I choose the vehicle model that I want to hire? Vehicle bookings are made based on categories and not based on models. Unless a particular model is actually available, which will need confirmation, EUROPCAR cannot guarantee a specific model; it can only guarantee the vehicle's category. Some vehicles are not available in all our car hire stations; you will get further information directly from our agencies. Are Insurances included in the quoted rate? Third-party cover is always included in our rates in accordance with the legal dispositions provided by the current Moroccan legislation. This insurance covers damages to a third party as well as legal defence. L.D.W. : Contractual Bond in case of damage to and/or theft of the vehicle, with excess. S.L.D.W. : Super Contractual Bond in case of damage to the vehicle; reduces the driver's responsibility in case of damage to and/or theft of the vehicle. Unless EUROPCAR cannot recover the amount of the damages caused by identifying the responsibility of a third party, the customer renting the vehicle is responsible for all damages to and/or thefts of the vehicle for the duration of the hire. This responsibility can be reduced by taking out an optional guarantee per day of hire. This taking out does not replace the payment of the non-redeemable excess charge that corresponds to the damages done to the vehicle. For more information, please enquire at the time of booking or when picking up the vehicle. P.A.I. 'Personal Accident Insurance': Optional guaranteed insurance with a limit covering the driver and the passengers. It is strongly recommended for those customers not covered by personal liability insurance to take out this additional insurance. All the drivers of the hired vehicle must appear on the rental contract in order to be covered by EUROPCAR insurances. Please enquire at the time of booking or when picking up the vehicle. ATTENTION: loss of, theft of or damage to personal belongings of customer/driver/passenger or any goods present in the vehicle are not covered. The customer is free to take out a personal insurance with insurance company of his/her choice. What do the LDW and SLDW abbreviations mean? - L.D.W. "Loss Damage Waiver" (exemption regarding collision/breaking and entering/theft/loss): covers damages up to a non-redeemable excess charge. Rate according to vehicle’s category. - S.L.D.W. "Super LDW" (Super exemption regarding collision/breaking and entering/theft/loss): covers damages up to a fixed non-redeemable excess charge. Rate according to vehicle's category. - 240 Mad all taxes included delivery or return to EUROPCAR counter located at the airport. - Mad all taxes included per driver and per hire (contract). - Return to a EUROPCAR agency in the same city: possible and at no additional cost from one day of rental in the agencies located in the city. - Return to a different city from the city of departure: possible for 700 MAD tax included .Please enquire from EUROPCAR agency at the time of delivery. What are the terms of delivery/return ? The service of delivery & return/pick up of the hired vehicle is free during opening hours of EUROPCAR hire stations, in the EUROPCAR agencies located in the city, in hotels and stations in cities where EUROPCAR is represented. The delivery & return/pick up at EUROPCAR hire stations located at airports is subject to an airport additional fee. The service outside opening hours and outside cities where EUROPCAR is represented or in cities where EUROPCAR is not represented is available only upon request and subject to an additional fee. Please enquire at the time of booking or when picking-up the vehicle. What is the minimum hire duration? The minimum hire duration is one day, i.e. 24 hours non-fractionable with effect from the exact time when vehicle is taken. If you hire a vehicle at 10 am, you should return the vehicle not later than 10 am the following day. Can a person other than me drive the hired vehicle? Only drivers whose names appear on the hiring contract and thus covered by our insurances can drive the vehicle that you have hired from EUROPCAR. In order for any additional drivers to appear on the contract they must show their driver's licence when picking-up the vehicle. Is there a minimum age to hire a car from EUROPCAR? The driver must be at least 21 years old and 23 years old for Prestige vehicles, and held a driving license for at least 2 years. What documents must I show at the EUROPCAR hire station in order to get my vehicle? - your passport or ID for national residents. Will there be a deposit deducted from my card when picking up the vehicle? EUROPCAR does not deduct the amount of the deposit, but asks for a preauthorisation of payment based on the amount of the hire and the deposit of the hired vehicle. Please enquire at the time of booking or when picking up the vehicle. Must I check the vehicle before leaving the car hire station? We do advise to check the condition of the vehicle that you have been given following the indication on the document provided together with the contract. If you find out any defect or bump, please let agents at the agency know before leaving. Can I earn Frequent Travellers miles by hiring a car from Europcar ? If you are member of the Frequent Traveller programme, in partnership with EUROPCAR, your rentals from EUROPCAR will allow you to earn miles following the predefined grid of earnings. Can I earn miles or Frequent Travellers points from a previous rental? In order to get your Frequent Travellers miles from one of our partners, please contact the airline directly.